Whooooo Hooooo!!!! Dylan made All-Stars!!!!! We are so excited baseball continues!!! We have been practicing everyday the past two weeks..it has been extremely busy, but fun for sure. The first practice was a week ago Monday. During the season Dylan played first base, but it looks like he will be playing catcher during all-stars. The first baseman we have on the team is awesome, so we figured Dylan wouldn't play there and it's ok. 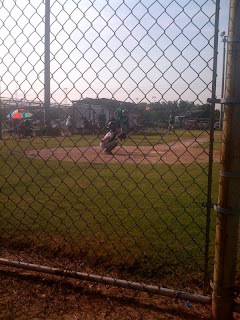 He is doing really good at catcher. When he first suited up, I personally had a major panic attack..but then I thought he is protected all the time and after watching him play there I realized he is actually really good there. He keeps the ball in front of him, most of the time and he can throw that ball to 2nd! Then about our 3rd practice I heard him tell the coach that he wanted him to keep throwing pop flys to him until he caught three in a row..Whoa, did that just come out of my son's mouth?????? I think this is on position he is really wanting to play. I'm proud of him for trying so hard at this position!!! He's doing so good. His hitting is finally picking up a little. Someone(not naming any names here) bought us a pitching machine....so we have been practicing on his hitting alot. Hopefully that will help alot!!! I noticed tonight at practice he is doing alot better. Pretty, pretty hits...just sailed into center field. Anyway, we have our district tournament this weekend...if anyone wants to come watch him play(dad) we would LOVE it! You would enjoy watching him play, he is really good. Our State Tournament is in Pea Ridge and our Regional is in Lake Village. I think they are both "open" tournaments, which means we can play if we want to, so I'm keeping my fingers crossed our coaches will think we are good enought to play these tournaments. Would love to play there especially Lake Village because my family can come watch Dylan! Wish us luck. We played Drew's last t-ball game last night. We have decided to put him in pitching machine fall ball. We let him hit with the pitching machine this past weekend and he's pretty good..I just worry about him fielding balls, but he might surprise me so we decided to take a chance on him after talking to some of the parents whose kids are on Dylan's all-star team and they are putting their kids in it and they are the same age as Drew. He is really excited about playing and if he does ok with it we are probably going to move him back to Van Buren and put him on Dylan's team for next year! So that is where we are right now..busy, busy, busy..but loving it!!! We love us some baseball!! Oh, I almost forgot...this past Sunday we were at practice for Dylan and Chris had to stay home because he had a migraine and I left Drew home to because he was asleep, well halfway through practice I was trying to get ahold of Chris and couldn't so I decided to leave to go home and check on Drew(we live like 5 min. 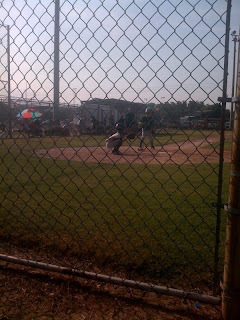 from the complex), I was pulling out of the driveway and my phone rings and it's one of the coaches wives telling me to get back as soon as possible because Dylan had gotten hit in the mouth with the ball and it looked pretty bad. Needless to say, I panicked and "tried" to speed, but for some reason I got stuck behind the old woman driving 25 MPH. 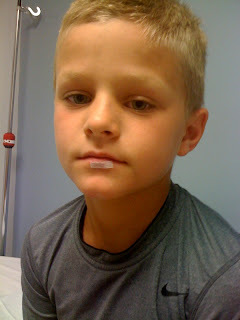 When I got there, they had gotten him calmed down and he had already told the coach he was ok and ready to go back in. Well, he wasn't ok and right under his lip was split into. Time to go to the ER. Didn't help that Chris had a migraine and was not able to get out of bed, but did help that my mother-in-law was able to go with me. Boy, I don't know what I would do without her! It's bad enough, that I don't handle situations like that well, but Dylan doesn't handle them well either, he is just like me so to have her there with me to calm my nerves and just to have someone to talk to was a blessing(thanks so much Mom)! We went to the ER and went to the hospital in Van Buren, I have never used this hospital before because our doctor is through St. Edwards in Fort Smith, but we figured it wouldn't be as busy so we went there...well, we were wrong and they were packed....of course! We were there with some nasty people, especially the lady sitting beside me who kept passing gas and blowing us out of the room and the woman who walked in with her husband and I swear she hadn't showered in a week! I live in this town and there are some disgusting people here...I just kept getting out the hand santitizer! 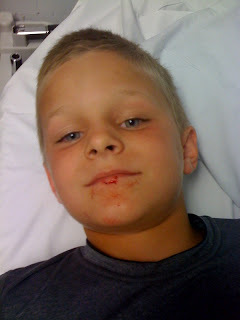 After THREE hours in the ER, we ended up just getting his chin glued back together..I was definitely relieved because I wasn't looking forward to possibly holding down a child to get stitcheswho would probably pass out from panicking so much! Even though, I know Super Glue will end up costing me about $500!!!! It was a long night, but he is doing ok and hopefully we won't have anymore ER visits this year!!! So that is it for now...we are gearing up for our tournament this weekend and hoping we do really good. We have a drs. appt. Thursday to make sure his chin is healing ok..he is still able to play, but just want "our" doctor to reassure me that it is ok.
Come on and join us this weekend for a fun tournament!!! :) Love you guys all so much!!!! Dylan looking like he's played catcher all along! 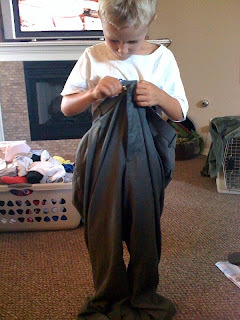 I just had the share this, Drew decided to try on Chris' pants...too cute!! !